These trails are maintained by Peaks Island Preserve. www.peaksislandlandpreserve.org. 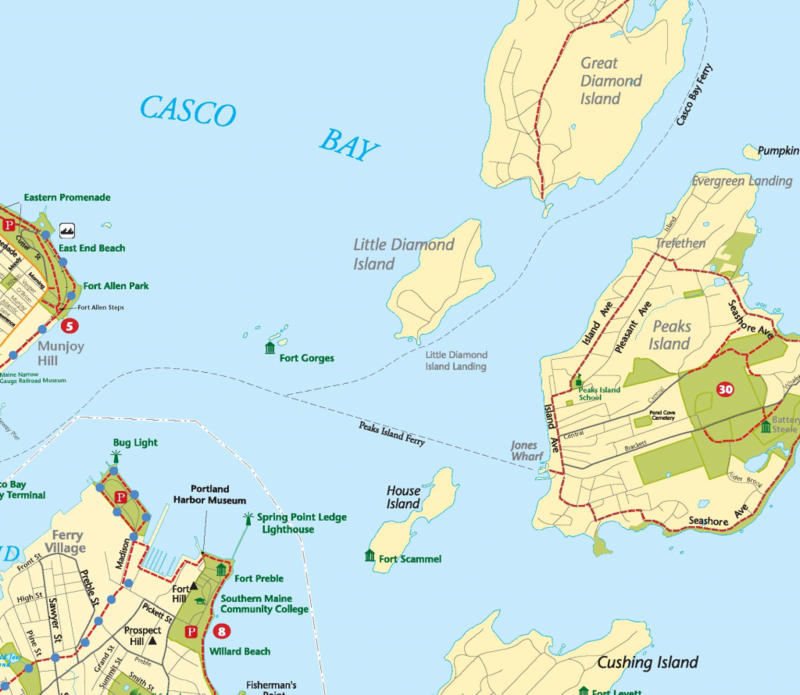 Peaks Island, a residential island off the coast of Portland, offers spectacular views of Casco Bay , the Atlantic Ocean, coastal towns, and neighboring islands. A scenic 20-minute ferry ride to the island from Portland is half the fun. The perimeter road is paved and mostly flat, approximately half waterfront, half residential. Many benches along the waterfront offer scenic views of the Bay. Traffic is minimal and slow-moving, but pedestrians should be careful. To access the loop, walk up the hill from the dock 0.1 mile to the first intersection. Turn right onto Island Avenue and go 0.2 miles to the 2nd right onto Whitehead Street (unmarked). Go 0.25 miles to 2nd right onto Seashore Avenue (marked). Follow Seashore to its end. Turn left onto Trefethen Avenue where you will go 0.1 mile down a steep hill. Turn left onto Island Avenue to return to the ferry. Bicycles are available for rent on the island.